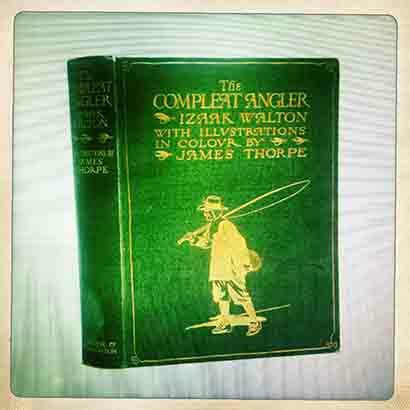 Though Fishpool has of course made special mention of Izaak Walton in the past, his seminal work, The Compleat Angler, has only ever been referenced in passing. First published in 1653, with countless reprints (only The Bible has been printed in the English language more often), The Compleat Angler tells of Piscator and Viator (Venator in latter editions) – master and student in the art of the angle. It is a classic. But let’s be honest, it’s not the easiest of reads. Just as Citizen Kane isn’t the first film you think of watching on a grey Sunday afternoon, The Compleat Angler will stay on the shelf while the fishing books around it are well thumbed. It isn’t boring, and the language is beautifully poetic, but it does require a certain state of mind. Rather like Shakespeare, if you’re not in the mood, then you hear little more than white noise. Having said this, Fishpool would recommend to anyone yet to read The Compleat Angler to do so. Don’t try and wade through it in one go, but dip in and out. Find the pieces that are of interest and enjoy the richness of the text and ponder the premise. Not every story must be told in one go.